The event will build on the achievements on the European Innovation Partnership on Active and Healthy ageing (EIP AHA), past and current research & innovation in Horizon 2020, the active and assisted living Joint Programme with EU countries and the EIT-KIC on healthy living and active ageing. Second European Summit on Digital Innovation for Active and Healthy Ageing. European Commissioner Gunther Oettinger, Markku Markkula President of the European Committee of the Regions and the Regional leaders representing the 74 Reference Sites of the European Innovation Partnership on Active and Healthy Ageing (EIP on AHA). Over 1600 participants joined us for the second European Summit on Digital Innovation for Active and Healthy Ageing (held in Brussels on the 6-7 December 2016). Throughout the 2 days we discussed how to take the shared-vision on digital transformation of health and care (Blueprint) forward and how the European Innovation Partnership on Active and Healthy Ageing can evolve in its pursuit of innovating at scale for a better quality of life for Europe's ageing population, more sustainable health and care systems and generate economic growth and investment. At the European Reference Sites awards ceremony, European Commissioner Gunther Oettinger rewarded the 74 regions, granted earlier this year the title of 'Reference Sites of the European Innovation Partnership on Active and Healthy Ageing'. The Reference Sites awards showcased the commitment of these local and regional organisations to invest over €4 billion in connected health and care for the ageing population until 2019 – an investment expected to benefit at least 4 million people across Europe. The "Innovation to Market" exhibition showcased some of the most innovative EU-funded solutions designed to deliver better health and care to the ageing population, ranging from robotics to integrated care, IoT enabled smart-living environments, fall prevention solutions and wearables for ageing well. This year's exhibition included the Speakers' Corner where 30 innovative start-ups and SMEs pitched their products and business ideas, looking for partners to help them scale up their digital solutions for health and care across the EU. In his keynote speech, Commissioner Oettinger noted that Digitisation of health and care is inevitable, necessary and has already started; but further opportunities await. Going digital for better health and care services is also a component of Europe’s Digital Single Market (DSM), and ongoing actions, such as the Blueprint and the Digitising European Industry strategy, are essential for ensuring that digitisation of health and care moves forward at full speed, leading to better outcomes for people, healthcare systems and innovative companies. This journey is just beginning, and we look forward to working with you in the implementation of the BLUEPRINT to ensure that digital transformation of health and care will benefit people, systems and the economy. 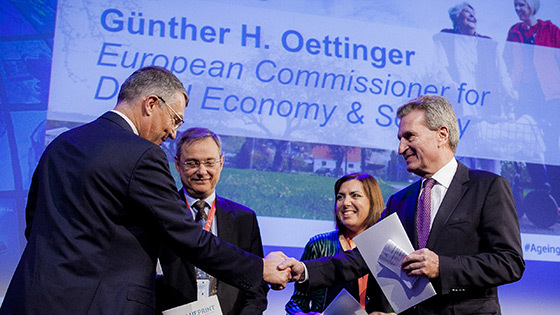 In December 2015 at the 4th Conference of Partners of the European Innovation Partnership on Active and Healthy Ageing (EIP on AHA), European Commissioner Günther Oettinger (Digital Economy and Society) outlined how digital innovation, enabled by a functioning Digital Single Market, can transform demographic change into an opportunity for Europe's economy and society. Commissioner Oettinger invited all stakeholders to work together with the European Commission in the development of a blueprint. A "shared vision" on how innovation enabled by a Digital Single Market can transform Europe's ageing society in the 21st Century and contribute to the European Silver Economy (keynote speech - 9th December 2015). Recognising that a shared vision is essential to mobilise investment and guarantee the commitment of all actors to this digital transformation of health and care for the ageing society, several industrial players, regional authorities, professional organisations and multistakeholder platforms such as the EIP on AHA have accepted the invitation from Commissioner Oettinger and agreed to start working in an initial draft of this blueprint. This shared vision will be discussed at the second European Summit on Innovation for Active and Healthy Ageing (5-8 December 2016). This flagship event is organised by the European Commission in partnership with the European Parliament and the Committee of the Regions. It will bring together over 1500 participants engaged in developing, investing in and deploying digital innovation for active and healthy ageing.